Las Vegas Superior Tree Service provides ANSI standard professional tree pruning, tree trimming, and tree cutting in Las Vegas & Henderson. Las Vegas Superior Tree Service provides tree pruning & tree trimming services. Pruning your trees on a regular basis keeps them healthy and beautiful. There are many different tree trimming methods for different species of trees, and for how you want your trees to grow. 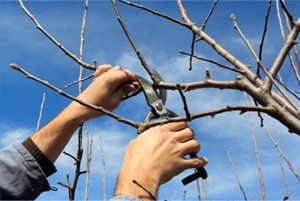 We can prune the trees back or remove them so that they do not interfere with your house or structure. We can prune out dead, hazardous and crossing tree limbs to keep your trees growing strong and healthy. Crown cleaning of a trees canopy consists of pruning excess branches and limbs out of the crown of a tree. Pruning the deadwood, and diseased limbs out of the tree is a healthy and common maintenance practice within arbor culture. One of the most common and natural techniques of tree pruning. Pruning out the dead and diseased limbs from a tree. Thinning out the interior crossing or rubbing limbs is a common and acceptable practice. Thinning can help reduce wind resistance in a tree, thus reducing the chances of a wind storm blowing over a tree. Elevating the lower limbs on a tree is necessary at times when limbs are encroaching on a structure, or hang low over a sidewalk or road, etc. When elevating lower limbs on a tree, it is important to take a step back and see the entire tree, so the tree is balanced after the prune. Clearing Limbs Away from a Structure!!! Are the squirrels keeping you up at night, or are the branches rubbing against your house? Clearing tree limbs away from your house or structure is a very common task. The branches should be cut properly, back to the nearest lateral limb just outside the branch collar.